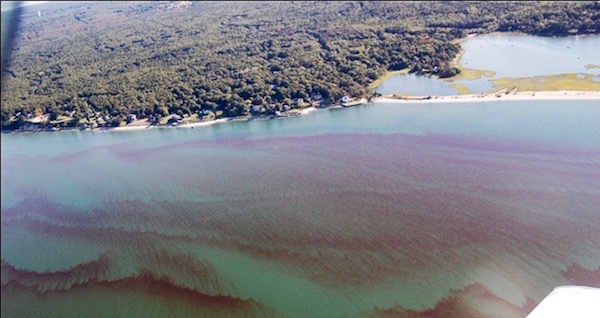 Rust tide, which is toxic to marine life at high densities, has spread across the entire Peconic Estuary during the past week, according to the Gobler Laboratory of Stony Brook University’s School of Marine and Atmospheric Sciences. This news could prove unsettling for this coming Peconic Bay scallop season, which begins in November. The lab said in a press release Tuesday morning that what began as isolated patches in Sag Harbor and Three Mile Harbor earlier in the month has now spread from Riverhead to East Hampton at densities exceeding 3,000 cells per milliliter. Densities of the rust tide algae, known as Cochlodinium, above 500 cells per milliliter can be lethal to marine life. While large kills have not yet been reported these year, prior rust tides have brought kills of both wild and aquacultured populations of fish and shellfish on eastern Long Island. Dr. Gobler added that rust tide had been subdued in 2013 and 2014 due to lower water temperatures during the unseasonably cool summers. Beyond temperature, a 2012 paper from the Gobler laboratory identified excessive nitrogen as a second, equally important driving factor. The study, published in the international peer-reviewed journal, Harmful Algae, demonstrated that high nitrogen levels make rust tides more intense and more toxic. According to Dr. Gobler, as nitrogen loading has increased into eastern Suffolk County waters, these events have intensified. The study also pointed out the flexibility of the rust tide organism — it is able to feed off of high levels of nitrogen in near-shore regions but is also able to persist at lower levels in more open water sites. Experiments conducted in the Gobler Lab have demonstrated that this alga can kill fish in hours and shellfish in days. In recent years, bay scallop levels in the Peconic Estuary have trended with rust tide intensity. The last major rust tide, in 2012, was accompanied by a large die-off of scallops in areas where the algae concentrations were highest. In 2013 and 2014, the bloom was very mild and scallop harvests increased dramatically. The impacts of this year’s rust tide will depend on its duration, coverage, and intensity of the event, said Dr. Gobler. “We anticipate the rust tide will intensify in the Peconics and spread to Shinnecock Bay in the coming weeks. Blooms typically persist into the fall or until water temperatures drop below 60 degrees,” he added.